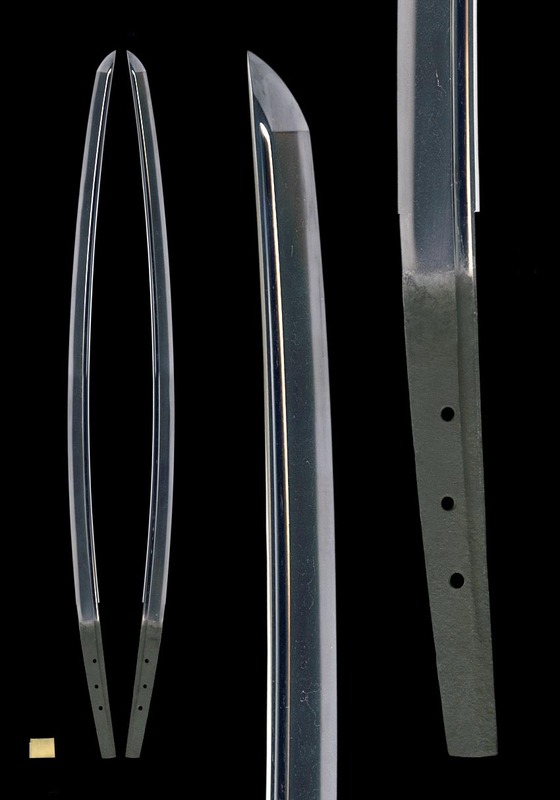 Blade construction: Shinogi-zukuri, Iori-mune. Substantially shortened "Ōsuriage". Mihaba on base is a bit on wide side and less degree of tapering from base to point holding waist pointed deep curvature leading to the middle point of Kissaki. There is a pair of bohi grooves that chiselled half way to the tang of Nakago. Forging (Hada): Forging is fine Ko-Itame mixing with Ko-Mokume hada which is conspicuously perceived like a fine wrinkles of silk crepe "Chirimen-hada". A bit on coarse side Ji-nie granule attaches on surface that emits speckled sparkling reflection of Nie and gives off diffused reflection with mottled effect so called "Midare-Utsuri". Darkish lines of Nie so called "CHIKEI" activity that outstandingly wells out from steel. Temper (Hamon): Hamon is a bit on coarse side Nie hard metal granules base, Suguha sedate wave boundary line, small Gunome indication appears, where the slanted upward feet of Gunome appears frequently. The quenching activities such as floating "YOU", flayed "Hotsure" runs along boundary area. The interior of temper is filled with mist-like crystallize area deeply with short lines of nie SUNAGASHI and bright thick line like threadlike KINSEN areas. The entire temper is full of rich "Nie" hard metal granule activities which is energetic, vividly bright and clear. Temper of tip (Boshi): Temper of boshi forms slight irregular lines of "Midarekomi" with sweeping up and threadlike KINSEN indication, small circle turns back. Tang (Nakago): The tang is substantially shortened "Ōsuriage" to be unsigned with slanting left (Katte-sagari) filemarks. Horizontal "Kiri" heel shape. Three peg holes. The birth of AOE lineages down the Takahashi river (now western part of Okayama pref.) dated back to end of Heian period 12 th century had flourished until Nanbokucho (the Period of North and South Dynasties) end of 14 th century. Since AOE belonged to South Dynasty with a common destiny, they disappeared after Ouei era of Muromachi period. Among those works of AOE lineages, they are distinguishable by it's age, "Ko-AOE" (old-AOE) 古青江 on before middle of Kamakura period and the other works after middle of Kamakura down to Nanbokucho is called "AOE" 青江. The essential peculiarity of Ko-AOE work is the most graceful in shape and to shows an indication of basic straight quench boundary lines with profuse Nie of hard metal granules, whereas "AOE" works in Nanbokucho period shows stirring shape in general and to show an indication of tight lines of Nioi based temper line with the feet slanting upward activity. In view of this katana with such a brave shape, conspicuous but detailed wrinkles of forging mark is perceived with a clear appearance of diffused reflection of "Midare-utsuri" and the most dense hard metal granules of Nie fills the boundary line where interior is full of activities such as slanting feet, floating dots of YOU, short lines of Nie SUNAGASHI and bright thick line like threadlike KINSEN so that it is generally supposed that the age is judged as the end of Kamakura period. Compared with other AOE works, sparkling Ji-nie hard metal granules appears most vividly with active Chikei scene on steel, further with an eye to appreciate the hamon, abundant activities of quenching effect is perceived , bohemian and powerful. The attribution of AOE is well agreed and holding such high quality of the blade then have been awarded with the designation of JUYO TOKEN is deserved. Gold foiled single layer Tachi-style Habaki collar, Preserved in a Shira-Saya plain wood mounting. Superb polish/Condition scale: excellent (using a scale of mint-excellent-very good-good-fair-poor).